• Let your child get in the bath when the water temperature feels right to him. He may need to stand in it a while before sitting down, in order to adjust to the feel of the water on his skin. • During hair shampooing, use a little pail or plastic bucket to rinse hair instead of using the shower nozzle. Water coming from a shower nozzle can be too direct and forceful. 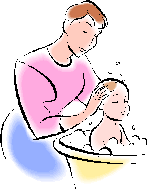 • When your child is old enough, allow him to rinse his own hair. Being in control of the pail and the water on his own head is less shocking to him than when someone else pours water on his head. • Use a facecloth to cover his face if water on the face will cause distress. Then allow your child to wipe his own face with a damp facecloth. • Use distractions in the bath, such as bath foam or toys, to make bath time more appealing. 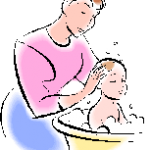 • Let your child decide if showering is preferable to bathing (when he is old enough). • Remove tags from clothing before wearing. • Let your child decide what kinds of clothes feel good on his skin. Usually brushed flannel or soft cotton or acrylic fabrics work well, but your child will know. • If your child hates getting dressed in the morning (due to the sensory changes), dress your child the night before in the clothes he will wear the next day. In other words, let him wear his clean clothes to bed. He may look a tad more wrinkled in the morning, but he will get his day off in a sensory calm way. • When you find a pair of pants, a shirt or outfit that your child loves (i.e. it “feels right”), buy two of them. This way, one can be laundered when the other one is being worn. Or, buy them in different colors if possible. Comfort – not fashion – is key here. • As much as possible, have healthy choices available. 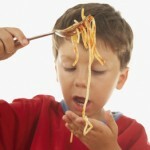 If you know your child loves chicken with pasta, then make a double portion. This way you can feed it to him another night in the same week, even if the rest of the family is eating something different. This allows you to eat together as a family and yet you did not cook two meals in one evening. • Freeze individual portions for meals on the fly, for the babysitter to serve to him, or when the family meal is sure to be too hard for your child to swallow (literally). • Ask your child’s pediatrician or consult with a Registered Dietician who is familiar with sensory issues to learn other ways of getting your child to eat a healthy diet. 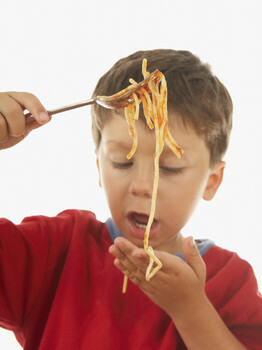 Perhaps mixing vitamin powder into your child’s food (such as spaghetti sauce) or offering protein shakes will substitute nutrients that your child may be missing. • Prepare your child for events that may be uncomfortable, such as large assemblies with people clapping, musical events, a meal in a big restaurant, birthday parties, etc. Soft ear plugs are often helpful to use at these events so keep them handy. Other children prefer noise-cancelling headphones. • Once home, provide a quiet environment so your child’s ears can rest. These are just a few tips for getting through a day in a sensory successful way. See my prior posts: Sensory difficulties in children to learn more about the different kinds of sensory problems that exist, and Help for sensory issues to learn about different treatments. Ask your child’s pediatrician if a treatment such as Sensory Integration Therapy (a form of Occupational Therapy) may be helpful. You can also discuss other treatments which are available. Feel free to share what has worked for you and your child. We’d love to hear from you! If you have questions, or would like more information, please email us at AskUs@marchofdimes.org. Note: This post is part of the weekly series Delays and disabilities – how to get help for your child. It was started in January 2013 and appears every Wednesday. 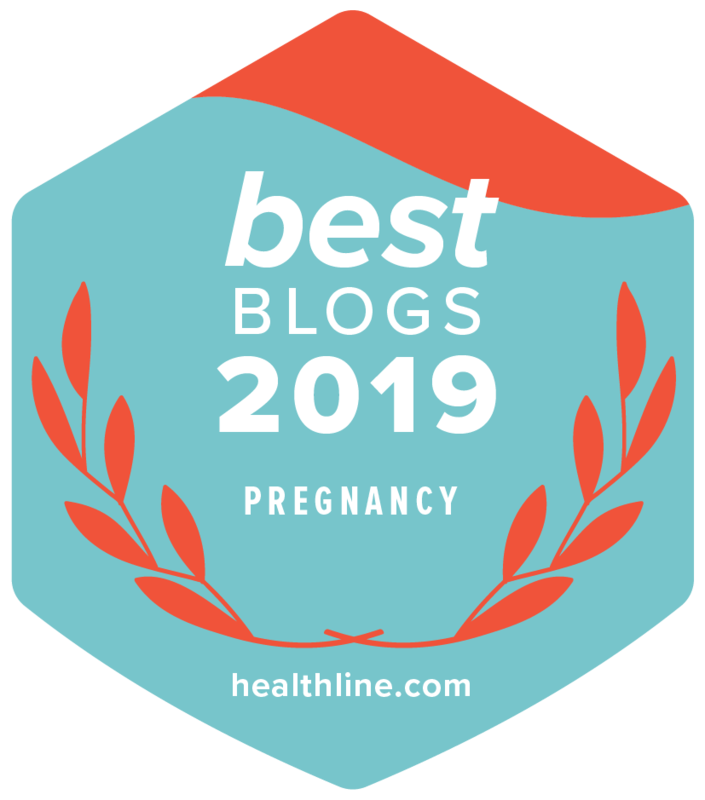 While on News Moms Need and click on “Help for your child” in the Categories menu on the right side to view all of the blog posts to date (just keep scrolling down). We welcome your comments and input. Wonderful ideas. My girls have suffered with sensory issues. Mostly clothing textures but there have been a few hygiene and food ones.